Azio MGK L80 RGB Mechanical Keyboard Review | Nerd Much? 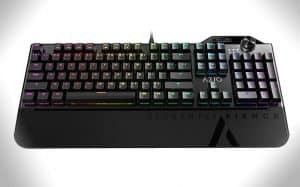 It’s hard to stand out in a market that’s constantly saturated with new gaming keyboards, but the Azio MGK L80 RGB Mechanical Keyboard manages to set itself apart with a few key features. At first glance, the most notable feature is the prominent volume dial, which you don’t typically see in gaming keyboards, which has a very retro stereo tuner kind of vibe. Its location in the upper-right corner, size, and dial mechanic make it easy to adjust your volume on the fly, like when you’re in the middle of an online match and can’t pause to hunt for a volume button. You can also push the dial to toggle mute. As far as aesthetics go, the second thing you’ll notice is the vibrant programmable RGB backlighting, which includes six different equally attractive modes of lighting effects, including a custom mode that allows you to assign a color to each individual key. Other modes include a Wave Mode, where the backlight moves across the keyboard in a subtle gradient format, and a Reactive Mode, in which each key you press illuminates and then slowly fades. The mechanical keys are very responsive thanks to the n-key rollover and provide a most satisfying clacking sound when typing; it’s not so loud as to become an annoyance, but is present enough to give you a sense of productivity as you type (I am typing this review on it now, in fact, and I feel more accomplished somehow). The retractable feet and the bottom corners are equipped with rubber grips on the bottom, which prevent the keyboard from sliding. No matter how hard you game, it’s not going anywhere. There is a palm rest for added comfort, which is magnetic for ease of attachment and detachment. It’s emblazoned with the words “Elegantly Fierce”, which seems an apt description of this keyboard. The aluminum faceplate is a nice touch and gives it a polished look. The keyboard can be switched into Gaming Mode, which disables the Windows Start key in case you accidentally press it, and also allows for recording and usage of the four Macro keys (F1 to F4). Macro recording is straightforward and incredibly easy, and does not require any software. The keyboard itself requires no software for installation, you can simply plug it into an available USB port and you’re good to go; it will automatically install all necessary drivers. In short, the Azio MGK L80 RGB Mechanical Keyboard is an excellent beginner gaming keyboard. It’s highly attractive, intuitive, simple to use, and well-constructed; however, it lacks some of the more advanced features you see in other gaming keyboards such as multiple profiles and additional gaming keys. If you’re not someone who utilizes those features and prefers a quality no-frills option, like me, then it’s an excellent value and well worth the $99.99 price tag. It will likely be my gaming keyboard of choice for the foreseeable future.